Our Service Center in Pittsburgh can also provide Instrument Calibration and repair for all the products we represent as well as other manufactures products. We are a Factory Authorized Barton/Cameron Measurement Warranty Repair Center offering full repair and calibration of the complete product line with factory fresh, new parts. 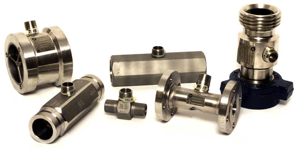 We are an authorized WIKA Instrument Pressure Gauge and Seal Assembler and can do direct gauge/seal assembly as well as remote mount capillary pressure and level systems. Our Service Center is very skilled and experienced with handling custom assembly packages specific to our customer needs and specifications. We have the ability to provide detailed parts which may involve castings, fabrication and welding. Tell us what you want, we get the parts and put it all together. We test and certify the complete skid/assembly package to your specifications prior to shipment.